Online networking sites, and the ways in which what we put out there now can influence our lives later, are topics I think all bloggers and social networkers should consider. For that matter, so is the issue of information overload and what impact that will have on both society and the human brain as we potentially continue to evolve. And how couldn't we evolve with life moving at such a pace? I don't think we can anticipate how these things will continue to change our lives, and the lives of future generations. It's not as if technology will ever stop changing; predicting what the future will hold is little more than speculation – unless, of course, this is your field and you have personal knowledge of what's waiting in the wings. I wouldn't want to begin to guess how technology will evolve in my lifetime, and I don't even want to think about what will transpire during my children's. 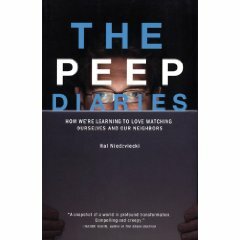 I know they'll look back on all that's happening today and think it's quaint, just as I look back at the computers I knew in high school – and even college - and remember how little practical application they had aside from word processing and spread sheets. Technology isn't my thing. I don't feel at home with much more than what I'm able to do with a medium amount of effort. Struggling with CSS code, to add pretties to my blog, are as advanced as I get. I feel comfortable with all the basics, and I'm not afraid of computers, but I consider myself pretty ignorant, and intimidated, by the great mass of technology that's out there. As an almost librarian, I'd like to become more at home with digital media, in order to familiarize myself with what's new and at least recognize what people are talking about when they refer to new technologies. It's crucial, really, for librarians to stay on top of what's new. If we don't I think we'll become outdated pretty quickly. Things are changing all the time, and libraries struggle to keep up. Older librarians, especially, are often reluctant to break out of old methods of doing things and try new technology. Not to pick on them, but I'm going by my own experience. I just don't believe we can keep going at that rate, or we'll become moot quickly, another quaint memory of times gone by. And that's the last thing librarians want to have happen. Speaking of technology, and social networking, I'm currently reading two books on the topics of its history and influence, whether it's navel gazing or has more value than that. It's not just an entertaining book, it's also packed with great observations on contemporary culture and what impact it may have on social interaction in the future. If you're like me, fascinated by the blogosphere, Facebook, Twitter, etc, I recommend this book very highly. It's fun and enlightening. "The best history makes up for narrow focus with rich detail. 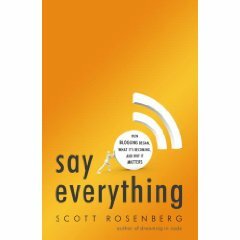 Rosenberg’s book delivers exactly that plus his personal insider’s view of famous and familiar bloggerati–the technology, the fiefdoms, the whuffie, the money, and the love. I learned new things about people I’ve known and read for years." —Lisa Stone, cofounder and CEO of BlogHer, Inc. This one's more thorough about the early history of what became blogging as we know it today. Packed with information, it leans less toward entertainment and more toward the evolution of social networking sites. Having this early history makes me feel much more informed, much more comfortable knowing what lead up to today's communication culture. Together, these two works give a full picture of what's at the heart of the reason bloggers love sharing, and why readers love reading what they write. I'm also hoping to learn more about the future, and what impact all this may have on society. In my own opinion, much of blogging is little more than navel gazing. I've read some that seem geared toward communicating with friends the blogger knows in real life, either that or they believe the world's sitting on the edge of its seat wondering what they ate for breakfast and what new accessory they bought. My own blog does some navel gazing. I'll admit it, but I at least try to include some substance some of the time. Other times I'm writing continuations I assume regular readers will have enough background on to understand. Maybe that's a mistake, but it's akin to finishing a conversation with a friend. That person knows the story up to a point, and the blogger fills in the conclusion, or the continuation. Writing about books and reading is an ongoing theme of mine, but I don't always (and for stretches rarely) keep to that theme. I spend a lot of time torn between revealing the horrors in my early life and worrying if I do how that may possibly come back to haunt me. I'm not so much worried about @$$holes leaving me mean comments about it as I am the prospect of a future employer, for whatever reason, using some of it against me. I think I'm pretty open, but there's a lot I keep to myself. If I had to guess why people read my blog I'd honestly say it's partly for the books, partly for the photos, and partly for what I try to communicate as my self-deprecating sense of humor. I'm tempted to post on politics, or world events, but for the greater part I restrain myself on that. It's not because I don't have opinions. Believe me, I do. My family's the recipient of my rants, much to their collective chagrin. It's not because I'm afraid of backlash that I rein that in. It's because I don't consider myself enough an authority to speak to a lot of it. Unlike a lot of opinion blogs, I admit I'm not informed enough to speak about matters I'll rail about at home, where it matters less how stupid I sound or how much I need correction. Out it comes, and that's my release valve. My purpose here isn't to speak about how pissed off I am about the current national and world situation. It isn't my intent to complain here about my disappointment with the current administration, or fears about up and coming nuclear proliferation. That's what the news is for. At the same time, I'm trying to find time to get up to speed with all that. But no matter how much more educated I feel about politics, I don't want this to become a political blog. There are plenty of those out there. Basically, I don't know how to classify myself. I guess that's the gist of it. That's why I'll never be a Dooce, because my focus varies with the day. I suppose if I did hone it down to one or two things I could move up in the ranks, but the higher you get the more people bug you. I'm low on the totem pole and I've been bugged plenty of times. I think I've learned my lesson. Why we blog is a complicated issue. I write much better than I speak, so share more here than I ever would in person. My low self confidence doesn't come through as much on my blog. I feel more comfortable talking to an audience of mostly strangers, and in a way that seems weird. Maybe I feel less judged that way? I honestly don't know. What I do know is I blog because it's fun, because it's a writing outlet that keeps me principled enough to write often, and because I've met some of the most wonderful people this way. For a while I let my head be turned by media sorts, and I'll always pay attention to review books and opportunities for interviewing authors, but, after talking with my doctor I realized the real reason I blog is it's fun. That's why I write creatively, too. If I take that out and exchange it with pressure, that's not so fun. Why do that to myself? That's why I'm here, in a nutshell. Or a nutcase. Depends on your perspective. But I'll never stop wondering why others blog and what it will mean for humanity. I'll keep right on reading, and right on blogging. That should keep me busy and out of trouble pretty effectively. I hope. P.S. : Please forgive any typos. I'm too lazy to edit today. That pretty much captures why I blog too. I keep mine mostly books and try not to put in too much personal stuff (like no names of my family, etc.) It’s my record of my reading, mainly. I like thinking that someone cares about my opinions, even if they don’t really. Rebecca, I admire how many books you review. I enjoy talking about family, posting photos and such, but I know a lot of book bloggers don’t. I model my blog after some of the personal blogs, the ones that talk only about family and life, but mix it up with the reviews. It is really lots of fun, as you already know. There aren’t that many people around who are into books like we are, so it’s nice reaching out to the world to find them. Without the internet things would be so much less fun.